Lewis Rice is pleased to announce that Michele M. McCue was named in the Commercial Real Estate Hall of Fame edition of Midwest Real Estate News, which spotlights the careers of the most talented commercial real estate professionals in the region. Michele is a member in the Kansas City office of Lewis Rice. Michele represents client interests primarily in commercial leases, real estate sales and acquisitions, development and redevelopment, and financing. 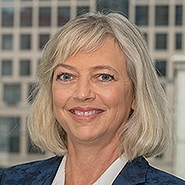 Her commercial leasing practice encompasses retail, office, warehouse, and other commercial leasing, including her representation of national retail operators in the leasing and acquisition of properties throughout the country.